It's not about how fast your car is; it's about the size of your truck. Living up to a name can be hard, but the P2XL really is the Ultimate Pickup. Designed with the same careful attention to detail that has made our other vehicles beloved by their owners, the P2XL features a full pickup bed behind our spacious cab. This is the truck. You work hard, so play hard. Make your next toy, a SportChassis®. 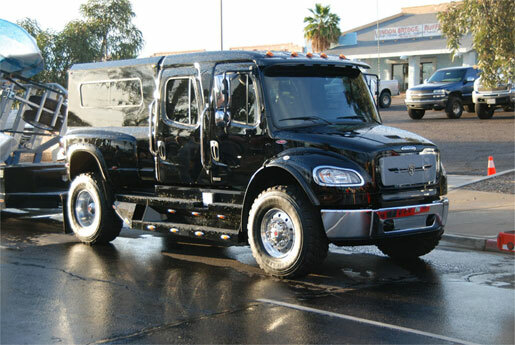 The SportChassis P4XL is the ultimate luxury sport utility vehicle on the planet. Everything about this truck is big! A 174-in. wheelbase, 100-in. width and 264 inches from front to back make sure that you impress. Four 425/65R 22.5-in. tires available in the off-road package powered by the Allison TRV3200 in a 5-speed configuration makes sure that you can go anywhere you need to. The Cummins ISC, an 8.3L diesel, rated at 350 HP with a 1000-ft/lb torque provides more than enough power to pull your boat up that slippery ramp or take you, your friends and all the toys to play in the sand. This year we are proud to announce our twentieth year as the industry-leading developer of cross country hauler trucks. In a market where only the strong survive, we have proudly achieved two decades of innovation and steady growth. The SportChassis product line has evolved considerably over the past 20 years in terms of design and application, yet the products themselves remain true to their core design values: hard-working, dependable and stylish. 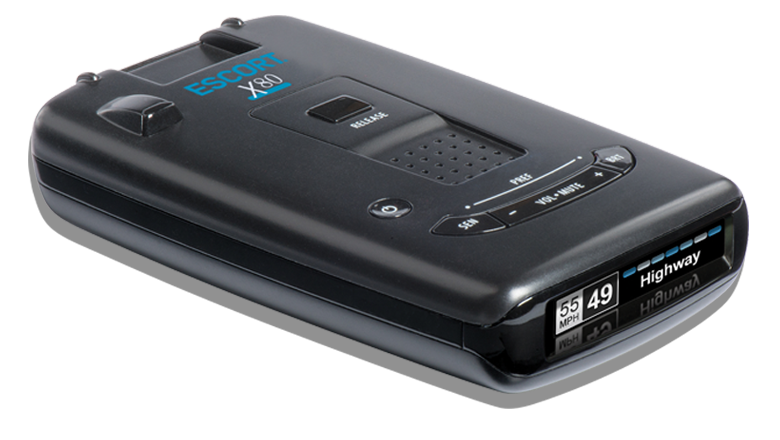 Introducing our 20th Anniversary Edition! Numerous upgrades to the stylish interior combined with the iconic look of our new grille, this beast of a pickup is a real attention grabber. Now with our unbelievable 15-year financing terms (available with approved credit) and the best pricing, our market has seen in years, that dream of owning the finest truck on the planet can now come true. 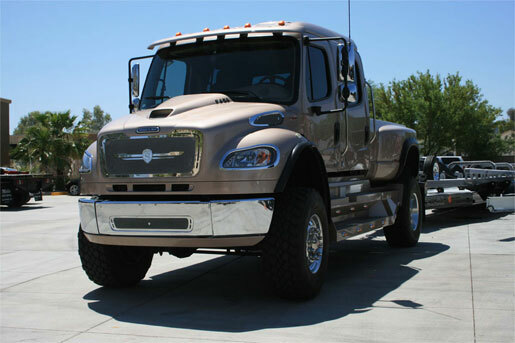 We began truck manufacturing operations in 1997 when we developed the first aluminum body hauler bed, designed for a heavy-truck frame. This new model, known as the Ranch Hauler, with its sleek aluminum fuel tank covers and iconic design began leading the industry in an entirely new direction! Our company vision to build the finest line of heavy-duty pickups in the world has pushed the standards of a cross-country hauler to new heights. Need more power? With a trailering capacity of 40,00lbs, the upsized RHA114 is sure to handle the biggest of loads. At 1650 lb-ft, the RHA114-450 delivers an impressive 57% more torque than the small block. By utilizing a Detroit Diesel 450hp DD13 and an Allison TRV 4000 for a drive train on a class VII chassis, the RHA114-450 gets the job done more efficiently. The P2-350 really is what it’s all about. A fully functional pickup with the power, safety, and security to haul you or your family, around town or across the country. 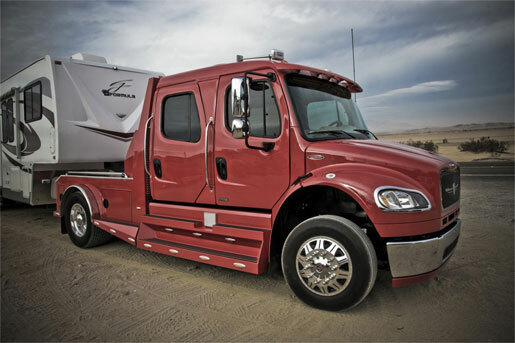 Designed to pull everything from the smallest trailers to a massive gooseneck living quarters, this does it all. The P2-350 unites a powerful Cummins engine and a reliable Allison transmission a pickup body on an enduring 500,000 mile rated chassis and as predicted the perfect pickup truck was born. Satisfying all your needs in one truck has been challenging; now with the SportChassis P2-350, you see what success really looks like. 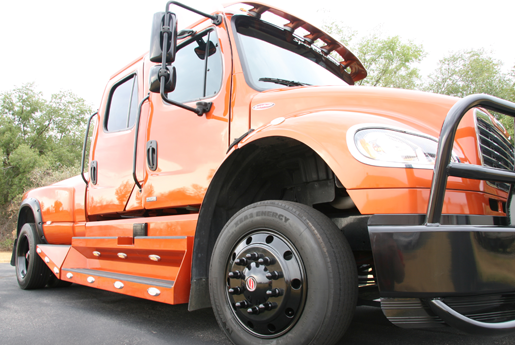 The RHA-350 by SportChassis is the most versatile heavy-duty truck on the road today. Engineered for comfort on the inside and a multitude of purposes on the outside, there is almost nothing you cannot do. 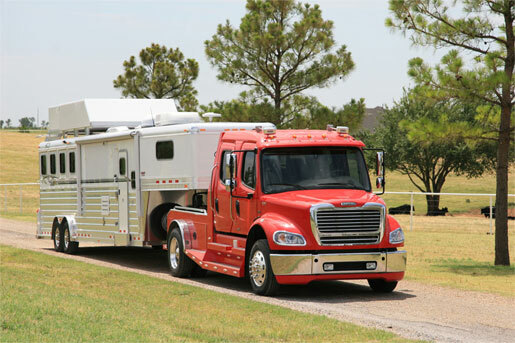 Pulling any sort of large trailer, horse, RV, cargo, or boat can be challenging. Lots of companies talk about how their truck can pull your trailer down the road, but our question is can they stop you? For us it comes down to mass, if what you're pulling is a lot heavier than what you're pulling it with, then you have a potential problem. Take a closer look at the RHA114-350 to see how this amazing truck gets you where you need to be safely, securely, and in style.